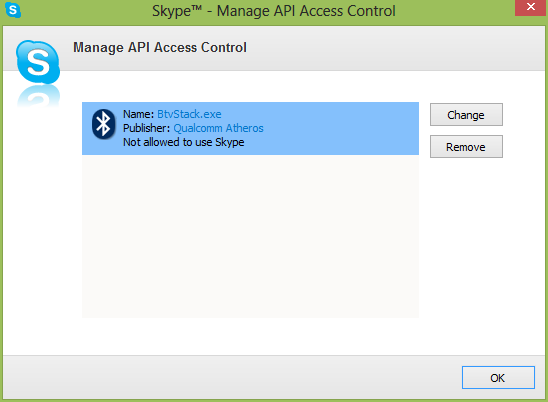 Skype shows notification about something called BtvStack with the message “BtvStack.exe is requesting access to Skype or BtvStack wants to use skype”. You might have wondered why is Skype asks me to allow the use of it? Well, the thing is there is nothing to worry about this. This BtvStack(.exe) is normally the Bluetooth Manager on your computer. 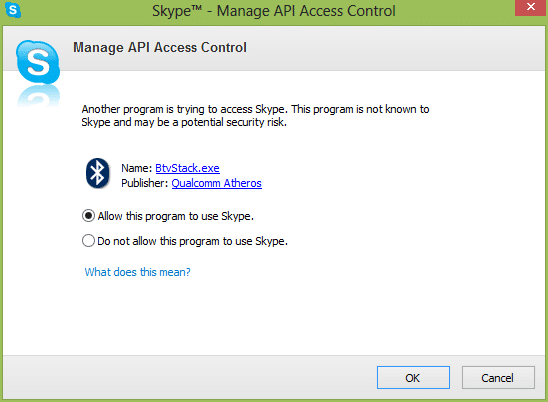 If you are not using any headset or Bluetooth devices with your Skype, then you can deny access or don’t need to allow this application. Otherwise, i.e. there's a Bluetooth device (e.g. A headset), then it’s best to allow this application. Generally, if you do not know what the program that wants to use Skype, deny that access. You always have an option, if change your mind later. Just follow the steps below. Tools » Options » Advanced » Advanced Settings » Manage other programs access to Skype. 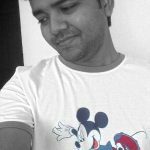 BtvStack.exe is part of the Atheros Bluetooth stack/drivers for windows computer.